If you’re finished with your relocation and are already quite settled after your relocation, then it’s likely that you’ve already taken in a fair amount of what London has to offer. 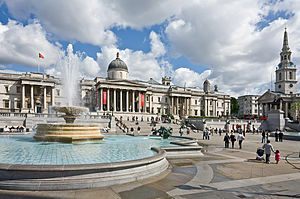 At least in terms of the obvious offerings, like Piccadilly Circus, Trafalgar Square and Buckingham Palace. But it can also be a lot more fun to hunt down some of the more obscure (and often more bizarre) things that this city has to offer now that you are an international relocation individual. It’ll allow you to feel more superior than others who are international relocation newbies to London as you are, but haven’t necessarily made the same effort to seek out London’s not-as-obvious highlights. Also, it can make for great conversation at cocktail and dinner parties. First up is the suitably odd Clown’s Service, a church service with clowns from all over the world paying honour to the memory of John Grimaldi, one of England’s most renowned clowns. Unlike most church services, this one is a somewhat more light-hearted affair. The service is bookended by performances by clowns, making it unlike any mass you’ll ever attend. It only takes place in February so you’ll have to wait till next year’s one unfortunately. Not quite as weird is the Roller Disco at the O2 Arena, running till the end of August. It’s got a true retro feel, right down to the disco balls and all, and it’s almost certainly a great night out. Over at Selfridges on the West End you’ll find the Icecreamists, an ice cream boutique offering sorbets, ice creams and frozen yoghurts’, all freshly prepared. Better yet, you’ll also be free to make your own flavour of ice cream, though you might be forced to stop short of Marmite and Tuna. Over at Tower Bridge Police Station, you can experience what it was like to be in London during World War 2 in the middle of a blitz. The experience of a blitz will be brought to life before your eyes, courtesy of picture and video, re-enactments and special effects. This is really just the tip of the ice-berg when it comes to the obscure side of London and hunting down more and finding them is as much fun as experiencing them and is about as fun as it can get when it comes to relocation.